I love pizza night! Traditionally a Friday tradition, but every once in awhile, you just need that pizza-pick-me-up mid-week. And if your’e like me, you’re a sucker for fresh bread — including fresh pizza. Well, good news — I’ve got a fail-proof, stand-by pizza dough recipe easy enough to make any day of the week. Even better news? This recipe makes enough dough for one family size (14 inches in diameter) or, you can make up to 5 individual size pizzas (8 inches in diameter). So whether you’re looking to feed the whole crew, or just you and your mate, you’ve got pizza night (or nightS) covered. Note about the Recipe: Dough can be refrigerated for up to 5 days. Love that pizza pic? 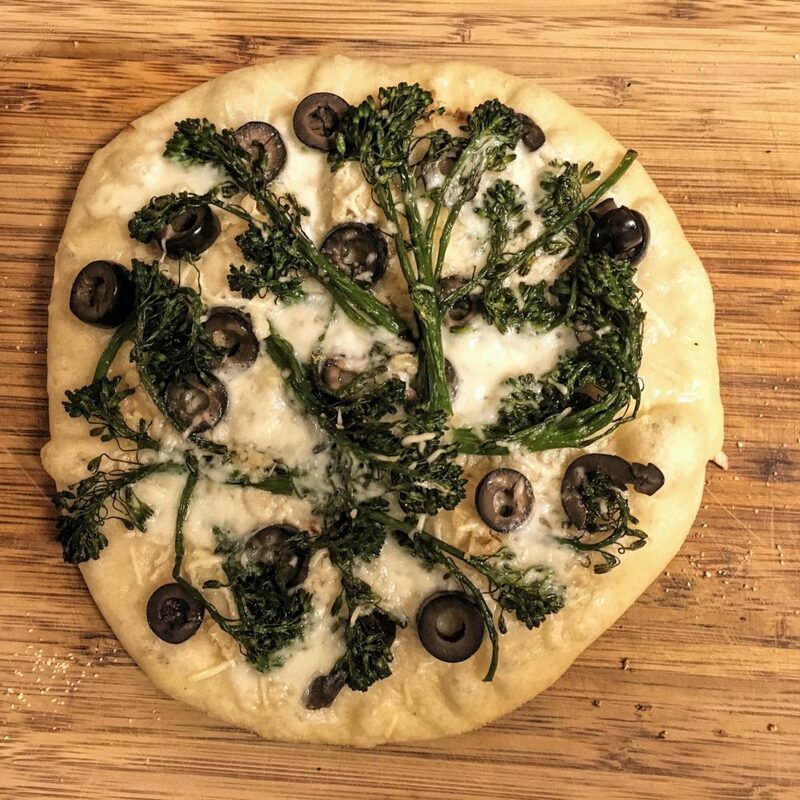 Check out my version of Broccoli Rabe Pizza! A pizza dough recipe so easy, you can have fresh, homemade pizza any night of the week! Pizza sauce and toppings of choice. In a large bowl of a stand-mixer, combine yeast, lukewarm water, and sugar. Whisk gently to dissolve the yeast. Let stand for 10 to 15 minutes, or until yeast "blooms." With the dough hook attachment on the stand-mixer and mixing speed set to low, begin adding flour, 1/2 cup at a time, adding the salt about half way through. Make sure flour is fully incorporated before adding the next 1/2 cup of flour. Once all the dough has been added, continue to knead the dough in the stand-mixer on low for 10 more minutes, or until the dough is elastic, but not sticky. It should easily pull away from the dough hook. In a clean bowl, pour in the 1 tbsp olive oil (or gently coat with olive oil spray) and spread around. Place the dough ball into the oil-coated bowl, swirling to coat the dough with the oil. Cover with a light dish towel or a cheese cloth and let rise in a warm place until doubled in size, about 40 minutes. Once risen, punch down dough and roll out, on a lightly floured surface, into desired size pizza crust. Dough is now ready to spread in the pan. Prepare a pizza pan by lightly spraying with olive oil. While the oven preheats, add sauce and desired toppings. Bake at 500F for 11 to 13 minutes, or until the dough is the desired amount of crispy and toppings cooked through. Dough can be refrigerated for up to 5 days.